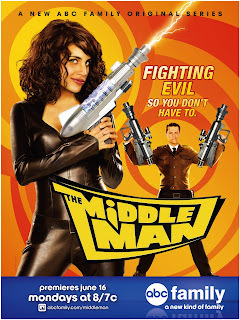 ABC Family has made the pilot episode of The Middleman available as a free download from iTunes a week before the shows airs on television. Despite some reservations after seeing the trailers, I went ahead a watched the show. In any event, the trailers I saw initially struck me as not really showing anything except that the executives who made them really had no idea what the story was about. The PSA spots were much better and showcased a tone and style that was more reminiscent of the comics. Which, to me, means that there a number of people working on the show who all have different visions and interpretations of how it should developed. Which further means that there's going to be internal struggles and some discongruity, and the whole show will go down in flames. That being said, though, the pilot episode covers the basic story of how Wendy Watson signs up with The Middleman. It's the origin story. And it's almost frighteningly similar to what was originally published in the comic. In all seriousness, it looked like they used the comic book as storyboards. In fact, with the exception of Natalie Morales looking nothing like the red-headed, freckled Wendy shown in the comic, it's almost exactly the same. And what's frightening about that is: it works. There were a few updates that I caught, without comparing the show side-by-side with the comic. But they were relatively minor, and only really served to make the show a little more contemporary. For example, in listing the comic books Wendy reads, she cited Mouse Guard which was not published until after the first comic series had been completed. But everything else about the comic was there, and I give the actors all a lot of credit for pulling off some unusual dialogue, not necessarily intended to be spoken, in a very natural manner. In short, The Middleman pilot was every bit as good as The Middleman comic. Presumably, two future episodes will closely follow volumes 2 and 3 (in which case, I'm eager to see an army of Mexican wrestlers) but I'm now certainly interested to see what other stories can be borne out of the idea but have yet to have been translated to the printed page. I'm hoping the production team can keep the momentum flowing, and I'll be interested to see how the show is received by the public at large. Well since I was working and had a lull in the actual "work" part of my shift, I just finished watching the ep on your recommendation. Thank you! I don't think I would have checked it out otherwise, and hadn't read any of the comics. But it was a very amusing show, I thought it was pretty corny at first but I chuckled throughout. I will definitely watch the next episodes. Now, correct me if I'm wrong, but is the main actor the same guy who played the Human Torch in the 90's Fantastic Four movie that was never released??? Hrmmmm... scary. Nope, different guy. Jay Underwood played the Torch in that unreleased FF movie. I haven't seen much from aside from a couple of TV commercials lately. The Middleman is played by Matt Keeslar, which appears to be his largest/most significant role to date. I downloaded the free episode off of iTunes and found it rather enjoyable. Thanks for the recommendation! I saw some of the same trailers as you and was wondering how you would go about doing them, especially to people who haven't read the comic books and didn't have any idea as to what the storyline was? I mean, the PSA spots I saw are funny and all, but they don't explain what the show is about, or why I should watch at all. Actually, I think something not unlike the PSA bits are the best way to go. Rather than tell/show people what actually goes on in the show, you give a general impression. I might expand the idea a bit, though, beyond just PSAs and maybe have some quick character interviews and maybe a faux news report and that type of thing. Present the TONE of the show, but not the actual plot.